First, make sure the EVE Agent is in Windows Startup folder. Then on the Options form of the Agent, make sure a User Name and Password are supplied and that the “Show Connection Form on Startup” box is not ticked. 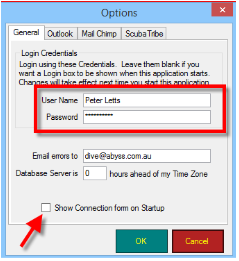 Can I use EVE Agent to send out Access Pass details to divers?